Shanghai - Chris Froome continued his dominant year by winning the China Criterium in Shanghai on Sunday, but the Briton admitted he faced an uphill task capturing a historic fifth Tour de France title. Froome, who this year became the first rider since 1978 to win the Tour and the Vuelta a Espana double in the same year, took the inaugural Shanghai race in a late sprint just ahead of Colombia's Rigoberto Uran and Warren Barguil of France. Froome, 32, won his fourth Tour de France this year and last month bagged the Vuelta, leaving only the Giro d'Italia as the last grand tour to elude his grasp. Winning it would make him just the seventh man to complete the career treble, but Froome declined to get ahead of himself. "The biggest thing for me at the moment will be to focus on the fifth Tour de France title and try to put everything into going for that," he said. "But I fully appreciate just how hard that is. After winning four tournaments, its definitely not getting easier, that's for sure." "The level is just getting higher and higher every year." Winning a fifth Tour title would put Froome in elite company, joining only France's Jacques Anquetil and Bernard Hinault, Eddy Merckx of Belgium, and Spain's Miguel Indurain. 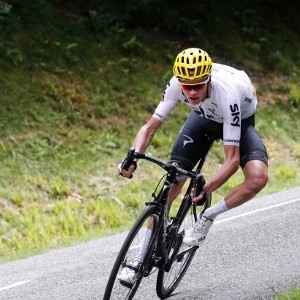 Froome sparked a late surge from the pack along with Uran, Barguil and Spanish two-time Tour de France winner Alberto Contador, who put in a strong showing in one of his final races after recently announcing his retirement. The Shanghai race was staged for the first time as part of the Tour de France's efforts to boost its brand in China, a country often called the "kingdom of bicycles". The race involved 20 laps around a 3-kilometre (1.9-mile) street circuit, and was organised by ASO, the same company that holds the Tour de France. Bicycles have long been the workhorse of urban transport for China's masses, but recreational cycling also is on the rise as incomes and leisure pursuits increase. The contest was held amid murky skies, however, with pollution readings in the "unhealthy" range. China's notoriously smoggy skies are among factors blamed for slowing development of cycling and other outdoor pursuits. "Cycling at the moment is a very European-dominated sport so it's great to bring cycling out to these places that don't get to experience what Europeans get to experience on their doorstep," Froome said. "So it's great for the globalisation of cycling and of sports in general."